If you don’t know what I’m talking about, you’ll want to read my prior post on this promotion here. This crazy promo is still going. It’s still right there in black and white on the Iberia website. 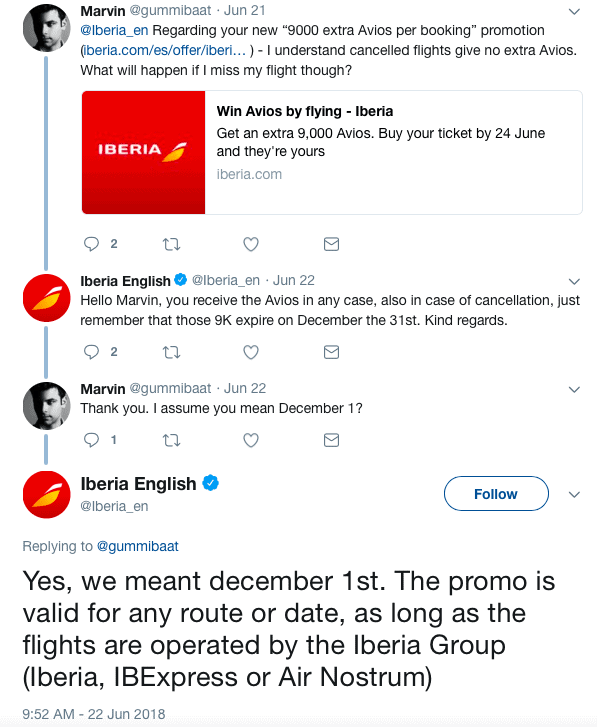 That an Iberia Twitter rep confirmed the promo validity and even that you don’t have to fly the flights to keep the Avios. So what did I do with this promo? I booked 10 one way flights from SDR-MAD on 10 consecutive days (I don’t recommend booking multiple seats on one flight as you risk auto-cancellation). Each one way was $27.74, making my total cost $277.40. Of course, I put the flights on my Chase Sapphire Reserve, so I’ll get 3x points on that for about $12 worth of Ultimate Rewards. So call it $265 all-in. Note that you can save a credit card, so it’s not terrible, though it’s a bit monotonous for sure. For that, I’ll earn 90,000 Iberia Avios. And no, I don’t actually know how I’ll spend them yet. And yes, they expire Dec 1 of this year if not used – so I’ll use them. But for under 80,000 Avios, one could fly from the Eastern US to Madrid on Iberia’s Business Class round trip and with minimal surcharges. Or you can spend them on AA operated flights if you can find availability. Or BA around Europe. Or any Oneworld flights…. Is there still *some* risk that Iberia tries to reneg on this due to the sheer volume of bookings they must now have for flights nobody will take? (I mean, really, there will be flights from SDR to MAD that are SOLD OUT and EMPTY!) There’s some small risk for sure. We just never know how these “too good to be true” situations will play out. Still, they’ve made an offer and MANY of us have accepted. I’m willing to risk the $265 on this deal. In theory, you can still book this weekend, though I’m sure the cheapest flights are drying up. You can use Google Flights to search across dates easier than on the Iberia site. Then go there to book. If anyone goes for this, please let me know here, on Twitter, or in the private MilesTalk Facebook group.